Here’s Theatre Intangible podcast #108: Savage Knights artist showcase, recorded in the basement of Noa Noa on April 5th, 2013. 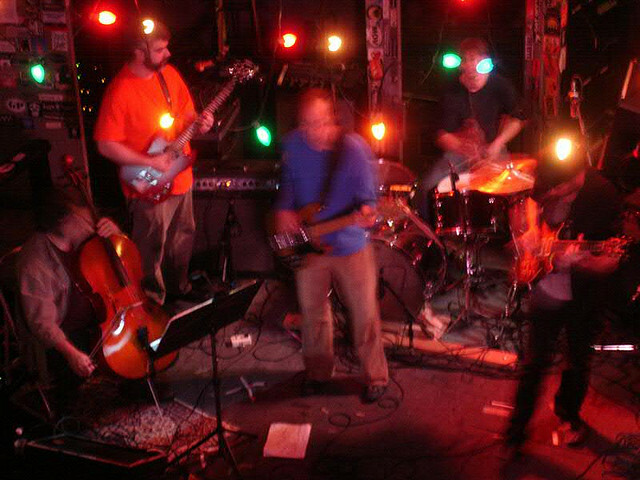 Savage Knights are an avant-jazz and rock n’ roll instrumental band from Raleigh, North Carolina. The band features Mike Isenberg on drums, Joey Chorley on bass, Chris Eubank on cello and Crowmeat Bob on guitar, alto sax, and bass clarinet. On this podcast, they start things out with an experimental improvisation featuring Mike on my Hammond student-model organ and then they perform some of their prepared material. Enjoy!